The numbers just keep going up. Yesterday, at our Kid's Workshop, we had over 350 children show up to hammer and nail and paint their little projects. Lots of noise as those tiny hammers missed tiny nail after tiny nail. And red paint? Foreshadowing of what the Oval Office is going to look like in the coming days as the Idiot Jerk tries to emulate the 'red queen' shouting "off with his head! Off with her head!" And then there was the dinner date the Idiot Jerk had with President Xi of China. All you have to do is look at the pictures to see somebody isn't happy. 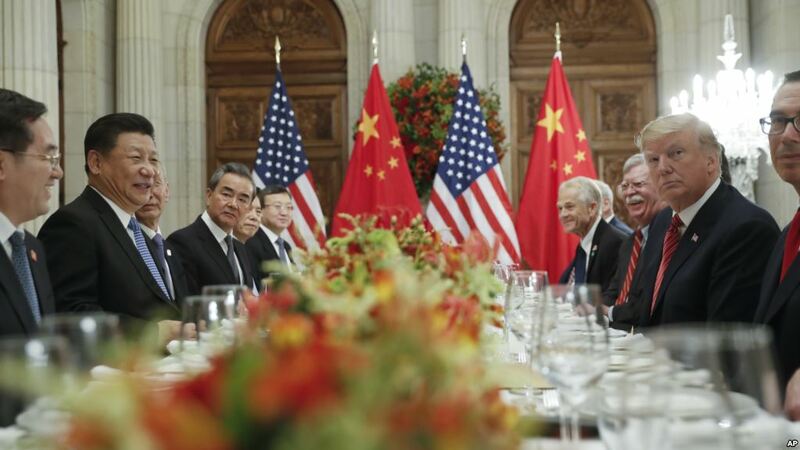 While Xi looks happy as hell, perhaps he was told he's getting a really big, tremendously large penthouse in Washington, the Idiot Jerk looks like he is ready to cry. One can only wonder if this is the result of Michael Cohen's guilty plea, and his confession, or maybe the Idiot Jerk is trying to think of some way in which he can deny those written answers he handed in to Mueller. Can't you just wait for him to begin blaming others for changing his words? Or maybe he looks so unhappy because they told him meatloaf was off the menu. John Bolton seems to be having a good time though, doesn't he? Steve Mnuchin seems deep in thought. Is he wondering if his Trophy Wife is banging her chauffeur, or possibly wondering how this meeting will look on his resume. Oh, and no more tariffs after January 20, 2019. The White House is calling this a win... now, hold your laughter. Maybe that's why Xi looks so happy. It could be that the Idiot Jerk realizes the fallout from Cohen's plea is going to be so tremendously bad... and I mean just really tremendously bad for him, that more tariffs might signal the death knell for his presidency. I would have thought he'd have known that someone started ringing that bell a long time ago, and it wasn't Anita Ward. Poor _____; he's now facing the reality that no one likes him, and he's about to go down ..... bigly. Well, there is that minority group who likes him, a lesson will be learned. the dump ain't happy he had to go to a foreign country where they speak spanish. and dinner was NOT brought in from mc dog chow. and there was no ketchup. and no faux noise on tv. and nobody else wanted to play with him in the sandbox. stoopid muthafucka! On our trip to Buenos Aries right after he got in office, I'm here to tell you, they HATED him down there. I can't imagine him in that beautiful city. And they all took pity on us. I wonder if they had taquitos? I love taquitos. The meatloaf reference is in regard to the first time he had dinner with Xi, and they had meatloaf. And the Idiot Jerk asked "isn't the meatloaf delicious?" over 350 children show up!!!! That would have called for a bottle of gin on the job for me. Wait till next week, Santa's going to be here. oh lard, I don't know how you stand it. kids drive me around the bend so bad that I wanna bitchslap them all.